Even with avid CD collectors 19th Century music by Belgium composers is little known. Once one strips away the Belgian school of violinist/composers (Ysaye, de Bériot, and Vieuxtemps) and the honorary Frenchman Cesar Franck most people would struggle to name many others. But it should come as no surprise that there was an active group of composers centred on the Music Conservatory in Antwerp. The key to this lack of knowledge is that for many years the founding father of this musical/aesthetic dynasty - Peter Benoit (1834-1901) focused on producing a body of choral and vocal work. Not only did this significantly hamper the development of a Flemish symphonic tradition but at the same time the use of Flemish in these choral works would severely limit their international dissemination. It was not until the final years of the century that some composers sought to redress that balance. 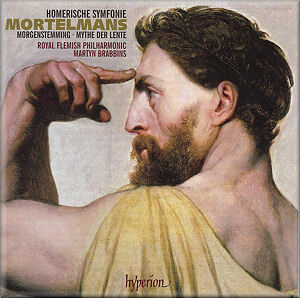 Lodewijk Mortelmans was one of that group and the main work here - the Homerische Symfonie - is his most significant piece of purely symphonic music. The two other pieces that comprise the disc neatly frame the symphony (a shame therefore that the disc was not compiled in compositional order perhaps?) with the Mythe der Lente predating the Symphony by some three years and, remarkably, the Morgenstimmung, although written twenty-four years afterwards, is Mortelmans’ next orchestral work. The Symphony is a big and serious work. Timing at only a minute or so shy of three-quarters of an hour it would test the powers of any composer to sustain his musical argument over that kind of span. Each movement is given a title but to be honest I found them to be less than revealing - indeed the liner-notes point out that Mortelmans himself had an ambivalent attitude towards programme music. He tried to explain the symphony’s “meaning” as being his own musical response to having read the Iliad and the Odyssey. The result is a standard four movement work that is at heart conservative for the date at which it was written. The orchestra used sounds as though it is the standard “Brahmsian” orchestra and throughout there is little if any aural excess. Indeed there is a solidity to much of the writing that rarely implies the work of a still young composer not yet thirty. The writer of the liner-notes makes a comparison with early Sibelius and whilst I know what he means there is none of the earthy vigour of the Finn’s Kullervo. The comparison is valid given that Sibelius was 27 when his work was premiered to Mortelmans 30. The problem mainly lies in that Sibelius’ genius allowed him to forge an utterly individual symphonic voice out of a melange of Romantic musical influences. Mortelmans is not such a genius so we have formally a Brahmsian symphony with some Wagnerian musical gestures overlaid. But it would be quite wrong to imply that this is not an enjoyable piece because it is. Simply, after several careful listenings I find myself struggling to recall any truly memorable melodies or musical gestures. The heart of the work, and the part which contains the best music is the 2nd (slow) movement 'Memories of Patroklos's death'. This is a funeral march and I like the sombre dragging atmosphere Mortelmans creates. I suspect that this is because the mood here is more in tune with Mortelmans’ own temperament. This suspicion is reinforced by the 3rd movement (scherzo) ‘Sirens playing and singing'. As the liner-notes point out (I do like the fact that the author of these notes is less gushing and enthused than these people often are - he is positively sceptical at points!) it is hard to equate this well-behaved music with characters both seductive and murderous. At nearly twelve minutes long this movement outstays its welcome. The finale 'The genius of Hellas' is worked out with rigour but is again ultimately unmemorable. The final peroration has a heroic hymn-like quality but that is swept away by a somewhat perfunctory ending. I would guess that most collectors, if they knew any of Mortelmans’ music previously, would have heard it from the same sources as me, namely three discs from Marco Polo surveying Romantic Flemish music and two from the now defunct Discover label covering similar material. Both of the couplings here were available on those discs. The Mythe der Lente was coupled with symphonies by Jef Van Hoof and Arthur Meulemans and a suite by Peter Benoit (Marco Polo 8.225100). The Morgenstemming 'Morning Mood' was on another Marco Polo disc (8.223418) this time coupled with another Meulemans symphony and various other excellent pieces. My memory of those discs - which I have confirmed by returning to them as part of this review - was that the Mortelmans works were amongst the least interesting. That being said both works are superior to the symphony in successfully fulfilling a smaller scale remit. It does bear in on one though that Mortelmans was an arch conservative - the 1922 Morgenstemming being as untouched by the ravages of the previous decade as any piece I have ever heard. It is actually beautifully lyrical and benefits in its own terms from a melodic simplicity that is very charming. Mythe der Lente has a more skittish character although Spring as represented here is lyrical and beneficent - more Glazunov in The Seasons mood rather than Frank Bridge’s majestic Enter Spring. Production values are all that we have come to expect from Hyperion. Perhaps the recording is fractionally more resonant than usual from this source but this does allow the brass in particular to bloom to good effect. The Royal Flemish Philharmonic is a good orchestra without being exceptional, the playing always neat and tidy without having any moments of ear catching brilliance. Much the same can be said of Martyn Brabbins conducting, never less than competent but at the same time unable to lift this music out of the mundane - ultimately solid but uninspired music making. If your collection already contains the Marco Polo discs already mentioned the performances here are their equals without supplanting them. As this was an opportunity to showcase both the orchestra and the music of its native land I do wonder why this composer and programme was chosen. Without a shadow of a doubt Belgium produced finer romantic orchestral works around the turn of the 19th century.